Top Ten Tuesday: Best Character Names! 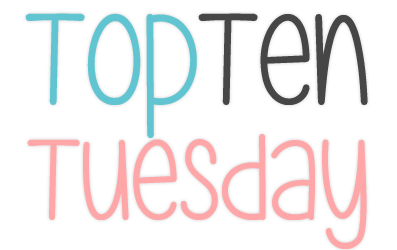 Top Ten Tuesday is a weekly meme hosted by That Artsy Reader Girl in which we create bookish lists about everything from our favorite characters to love triangles and everything in between! This Week's Topic: Best Character Names! For today's TTT topic, it was listed as "Best Character Names," but we were also encouraged to be as narrow, broad, or creative as we wanted. So basically, this is just a list of my favorite character names in books I've read! So without further ado (and in no specific order! ), here we go! * - This is because this is my favorite name of all time and if I have a daughter I've always wanted to name her Leah, so that's why I chose this one! Awesome post, thanks for sharing! But check back soon because we have something *HUGE*planned for our 6th blogging birthday! Guest Post by Author Molly E. Lee! 20 Back Listed Books to Add to Your TBR ASAP! Excerpt: Kissing Games by Tara Eglington! May Scribbler Unboxing: Fight Scenes! Jessica, Emily & Amber. 3 college girls that spend our days reading and sharing our thoughts in our corner of the Internet. No portion of The Book Bratz may be reproduced or used without the consent of Amber, Emily and Jessica. All books reviewed on The Book Bratz were either owned, borrowed or sent by publishers/authors. Books sent by publishers/authors will be stated in our reviews. Books sent by publishers/authors are in exchange for honest reviews. We are compensated in no way, shape or form. A publisher's knowledge of these reviews will not be known until they go live on The Book Bratz.